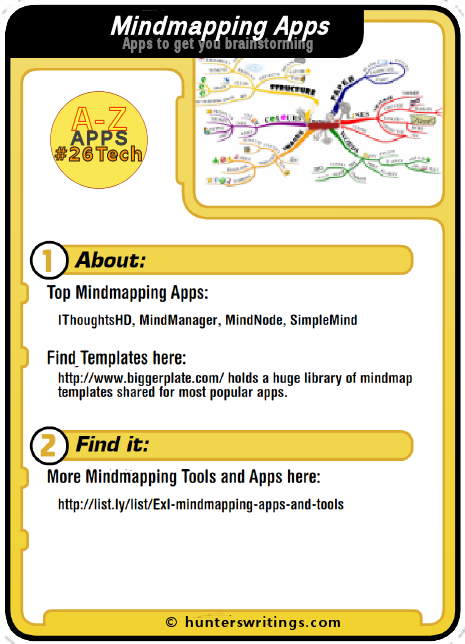 The M post for #26Tech A-Z Challenge profiles a few mindmapping apps for brainstorming and outlining writing or creative projects. 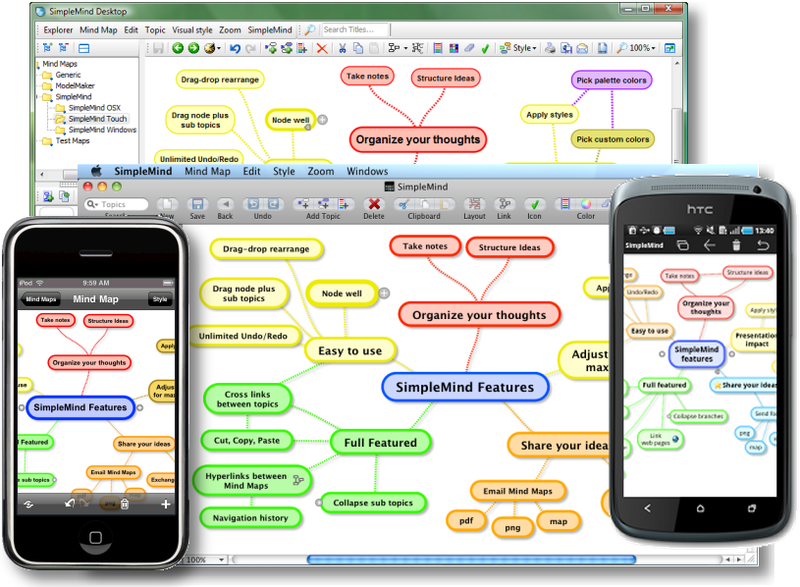 Mindmapping is a favourite technique for many writers seeking brainstorming and structural activities. There are plenty of webapps, software programs and mobile apps to support creating and sharing mindmaps digitally. 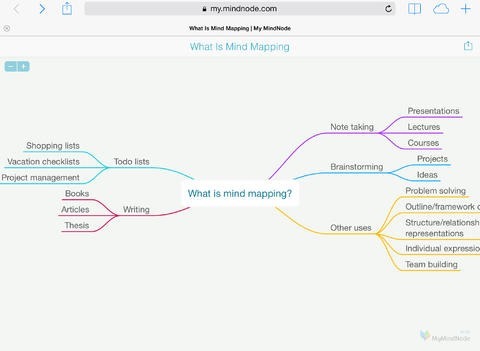 For a full list of mindmapping apps and websites, please see the listly list here: Mindmapping Apps and Tools. Please vote on favourites or add your own. For today’s post I’ve drilled down from this large list and will feature only a few which can be used on mobile devices for brainstorming on the go. iThoughtsHD imports and exports mindmaps for MyThoughts, Freemind, Freeplane, XMind, Novamind, MindManager, MindView, ConceptDraw MINDMAP, MindGenius and iMindmap. But with topics, colours, branch levels, image inserts, and various export options, the app provides just about everything you need without having to take it out to the desktop anyway. MindNode combines a Mac App with mobile apps through to iPhone and iPad, in a clean simple environment. iCloud or Dropbox syncing between desktop MindNode Pro and mobile apps. 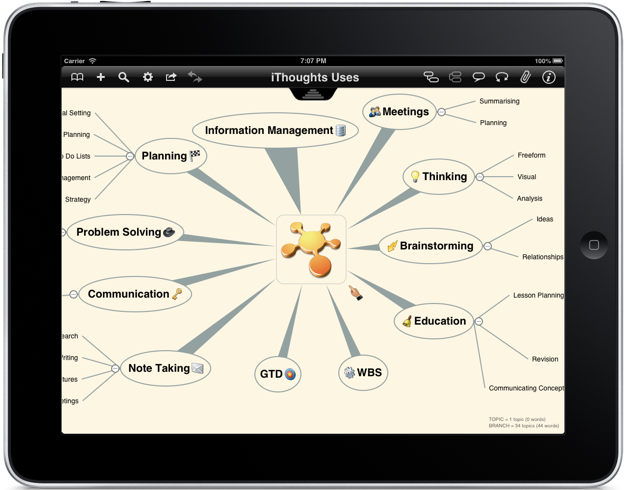 The iPAD version operates as an efficient standalone app for mindmapping, comparable in feature-set with iThoughtsHD. SimpleMind comes in several device versions, but the Android app in particular is a well-liked mobile app for mindmapping. Trials are available for desktop versions. The Android app is available in a free and pro version also. The iOS apps have a free version and with in-app purchases more features are available. However, the free versions of the mobile apps provide quite powerful functions anyway. You may want the full mobile versions to allow for Dropbox support through to desktop versions with your maps. In the upcoming O post, I mention two iPAD apps which combine freeform mindmapping with other notetaking features: MagicalPad and Ruminate. #26Tech: This was the M post for my A to Z challenge, where this blog will be posting 26 days worth of Tech posts relevant to writers and creatives. I profiled a huge list of distraction-freer apps including Freedom some time ago. Of course, I’ve not been able to test out many of them, so am glad you will be giving Freedom a go. I could surely use an app like this currently during the easter school holidays. Talk about being distracted constantly from my writing tasks – if only somebody could invent a distraction-blocker app for tweenies and their friends.